Once upon a time, in a land far away, there was a beautiful valley. In this valley lived 100 cows. The sun shone. The rains came in due season. The grass grew tall and lush. There was plenty for all. But only 10 of the cows were fat and healthy. They grazed freely upon the luscious grass and meadow flowers. Another 60 cows were not so fine. Never­theless they ate adequately and survived. The remaining 30 cows were very thin and sickly. They ate hardly at all. This was because, although there was plenty of grass for all, the thin cows had no money to pay the fat cows for the grass, which, for some strange reason, the 10 fat cows were deemed to own. The reason the thin cows had no money was because, unlike the 60 adequately-fed cows, they had no jobs. They had no jobs because the 10 fat cows did not need anybody else to work for them at the moment. The time came when 10 of the 30 thin cows said unto themselves, "Sod this for a game of soldiers!" and they went and ate the grass. But the 10 fat cows called the police (some of the 60 adequately-fed cows), whom they paid to protect their interests. The police took the 10 offending thin cows away from the beautiful valley and put them in a battery shed. Here it was deemed that they should be fed only what was necessary and sufficient for their biological survival until they died. Then 9 of the 10 fat cows began to have a bit of a con­science about the plight of the 30 thin cows. 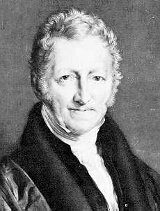 But, 200 years ago, a fat religious cow called Thomas Malthus had written a book. In this book, she justified this pernicious system and thereby salved the consciences of the 9 fat cows. The tenth fat cow did not have a conscience. The cow without a conscience decided that it was not right that some of the grass that grew in her part of the valley should be wasted in feeding the 10 thin cows who had committed the insurrection. She convinced the other 9 fat cows that they too should not have to contribute grass grown in their parts of the valley. The 10 fat cows together convinced the 60 adequately-fed cows that it was not just that they should have to work to gather and take the grass to the 10 insurrectors in the battery shed. The 10 fat cows therefore sentenced the 10 insurrectors to death. So they were duly executed. This was excellent. Now there were still 10 fat cows, 60 adequately-fed cows but only 20 unemployed thin cows. Time passed. Then it was noticed that 2 of the fat cows and 12 of the adequately-fed cows had become thin and malnourished. There were now only 8 fat cows, 48 adequately-fed cows and 34 thin cows. Each of the fat cows that remained had each gained 25% more of the land in the valley. Never­theless, the valley was actually producing less food. This is because the fat cows only now needed their valley to produce enough for 8 fat cows and 48 adequately-fed cows, with a little left over for the 34 thin cows to survive. The cows were surprised. After all, it was still the same valley. It still had the same productive potential. Then a thin wise cow remembered. In the time of the fat relig­ious cow, 200 years before, there were only 20 cows in the valley. Two were fat, 6 were adequately fed and 12 were thin. The population was lower but the distribution of wealth was worse. So the problem of the thin cows was not a lack of resources. It was the insidious system of rules under which the cows lived. Unfortunately, all power was still within the hands of the 8 remaining fat cows. They were completely beguiled by the ideas of the exigent cow without a conscience. And she thought the thin wise cow was talking poppycock. She did not like the presence of the poor thin cows. She saw them as a threat. She therefore ordered them to be eliminated. So then there were only 56 cows: 8 fat cows and 48 adequately-fed cows. Poverty was no more. All was well in the valley. But the natural laws are not mocked by artificial rules. 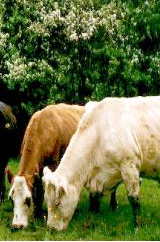 Soon, three of the remaining fat cows and 9 of the adequately-fed cows become thin. There are now only 5 fat cows, 39 medium cows and 12 thin cows. In accordance with the rules initiated by the fat cow without a conscience, the 12 thin cows are eliminated. As this cycle is repeated, it is noticed that the fat cows are becoming progressively thinner. So are the medium cows. This continues until the medium cows are as thin as the thin cows were in past eras. Yet the valley is still as big and still as fertile as it always was. Very soon, the few remaining thin (former medium) cows are no longer sufficiently well nourished to be able to work to support the lifestyles of the fat cows. The fat cows therefore do not let them have any grass. Therefore they die. But the fat cows do not know how to work. They only know how to give orders. Consequently, they cannot directly acquire their needs of life from the valley. And so they die. There are no cows in the beautiful valley. Of course, real cows don't behave like that, only humans do. Members of a popul­ation constantly exchange unseen signals. These are thought to take the form of odours of which one is not conscious, but to which the body's subsystems react. They control the fecundity of the population as a whole. In a time of plenty, they increase fecundity. In times of lack, they reduce fecundity. This way, population is kept within the limits that the environment can comfortably support. The problem is that the natural fecundity signals "know" only about the "plenty" that is physically present within the environment. They are not designed to take into account idiocies of human law and social convention that arbitrarily decide to exclude certain of us from our natural rights. The Earth's agriculture currently produces 2,671 kcal/person/day (for every man, woman, child on the planet). This is about 300 kcal/person/day more than is actually needed. Only 11% of the planet's habitable land is cultivated (general arable) with only 0·838% under permanent crop. There is more than enough food currently pro­duced on this planet to keep everybody fully and well fed. The planet is comfortably capable even now of producing 36 times this amount. So, why does human society always seem to gravitate into a hierarchical form that deliberately enforces such disparity of well-being, guiding it along the inevitable path towards self-destruction? The parable of the cows hinges around the cow without a conscience. Observing hu­man society, it is apparent that the vast majority of people are morally passive. They are like sheep. They want an easy life. They would rather avoid confrontation. They would prefer not to get involved. So they just go with the flow. On the one hand, they don't really want to hurt anybody. On the other hand, they suffer from no great moral conviction to help anybody either. The desire not to hurt and the desire not to help are, how­ever, not in exact balance in all individuals. They vary from person to person. Some people lean towards the desire to help whoever is in need. Others lean to­wards the desire for self-gain, even at the expense of damaging the interests of others to some degree. People thus fit into what may be described as a spec­trum of conscience. 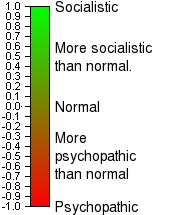 At the top end of the scale [green] are the more socially-minded whose aim is to help their neighbours. At the bottom end [red] are the go-getters whose predominant ambition is self-gain. At the higher extreme, there is a very small proportion of humanity whom we may describe as spiritually evolved. They are genuinely selfless in their quest to serve and support others. At the other extreme, there is a class of people we may de­scribe as psychopaths. These constitute about 1% of the human population. This is roughly the same proportion of the population that are schizophrenics. Most psychopaths are not serial killers. They are what are termed "socio-economic" or "industrial" psychopaths. They are not classified as mentally ill. Nevertheless, they are extremely dangerous and destructive socially. They appear to be devoid of the human attribute we call conscience. Within their minds, as if by some myster­ious agency, the mental mechanism of conscience has been perverted or suppres­sed. The psychopath is concerned only for himself. This concern may extend to his fam­ily, community or country. However, this is only insofar as he sees his family, com­munity or country as part of his patrimony or territory. A sub-criminal psychopath seeks his ends by exploiting others. To him, people are just resources. He cannot relate to them in an egalitarian way. He therefore feels perpetually alone. One may come across a psychopath anywhere. He may be the office colleague who gains your complete trust and confidence, whom later you discover has destroyed your career by covertly stabbing you in the back without apparent cause. He may be a seemingly benign relative, from whom one day you receive a callous action that demonstrates his utter disregard for your life and safety. He may be devoutly religious. I never liked my first mother-in-law. I always felt very uneasy in her presence and she regarded me as being of a far lower social class than herself. In fact, her man­ner of speaking to me was, to say the least, generally one of contempt. One day, I arrived late at her house with my wife and children. There had been a serious traffic accident that had delayed us on the journey. But to my mother-in-law, that was no excuse. She railed at me saying that my wife and children could partake of the meal she had made but I could not. Later she relented and gave me food separately. She scolded me saying that, as a good Christian, she gave me food because it says in the Bible that one should show hospitality to strangers. Many years later, I was having a conversation with the ex-wife of one of her sons. Not surprisingly, our conversation got around to the mother-in-law we once had in common. I related the above incident to my ex sister-in-law. Then my ex-sister-in-law drew my attention to the fact that my mother-in-law explicitly revealed that she regarded me as a stranger. She then followed by asking me if I realized that the Biblical commandment was the only reason she had given me food. She then suggested that, furthermore, the Biblical commandment was the only reason my mother-in-law had condescended to have me in her house at all. Most human beings have what we call a conscience. They would feed a visitor simply because the visitor needed feeding: not solely because some ancient text told them to. They would "feel" the visitor's hunger as if it were their own hunger. My mother-in-law did not have this sense. Her motive for feeding a stranger was completely selfish. She wanted to "go to heaven". To do this, she needed to obey what was said in the Bible. And it was for this reason alone that she showed hospit­ality to strangers. My ex-sister-in-law's observations were confirmed to me by memories of other events where my mother-in-law had shown a ruthless disregard for the well-being, safety and feelings of others. She did, for her own convenience, things that were collaterally damaging or hurtful to others. Any normal human being would, through conscience, desist from doing them. Invariably, they were things, generally to the workings of modern society, that were not explicitly prohibited in the text of the Bible. Conversely, she omitted to do things that a normal human being would feel obliged to do. Again because no obligation to do it was stated in the Biblical text. I have suffered the mischief of one or two others throughout my career and busi­ness life. But what happens when such an individual finds himself in a major position of power? Suppose I am one of that favoured few - a landed nobleman of an ancient kingdom or the president of a modern corporation. What is the essence of my behaviour towards my fellow beings? As the landed nobleman, I threaten, force and bully the common majority off the land. Without land, they cannot turn their labour into their needs of life. I know they cannot live without their basic needs. So I hold them to ransom. I give leave to some to work on my land to produce my needs and luxuries of life, in return for their minimal subsistence. I reward them no more than I would a plough horse. 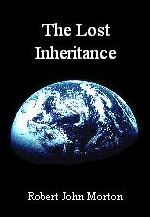 To the rest I give nothing in compensation for forcibly excluding them from their com­mon inheritance. As a corporate CEO, I threaten, force and bully the common majority out of the free market. They may not ply their trades, except through me. I know they cannot live without their basic needs. So I hold them to ransom. I give some leave to work within my enterprise to produce what can be sold to gain my needs and luxuries of life. In return I reluctantly hand to them their minimal subsistence. I reward them no more than I would my machines. To the rest I give nothing in compensation for ex­cluding them from the "free" market. Whether I am the ancient nobleman or the modern corporate CEO, I clearly have no regard for the wishes, feelings or well-being of the common majority of mankind. They are simply human resources, who exist for no other purpose than to generate wealth for me. My only relationship with whomsoever I choose is a purely economic one. It lasts only for as long as an individual remains of economic use to me. When his usefulness ends, then without concern or conscience for what may befall him, I bar him from his only means of turning his labour into his needs of subsistence. However, I will never admit that this kind of relationship is shallow, formal and cal­lous. While my slaves toil, I escape to my country retreat protected from the angry mas­ses by my hired thugs. I relieve the stress of my dealings by going far away on luxurious holidays. I eat excessively and fuel my car from crops that could have fed the starving poor of the countries in which they were grown. Even with my peers, my relationships are solely for self-interest. They are based on competition and laced with distrust. I bully, stress and humiliate my weaker peers. Then I absorb or destroy them. With those I dare not fight, I form cliques of alliance from within which I try to deceive and manipulate to serve my ends. I am the cow without a conscience. But I cannot survive and succeed alone. I do not have the power. I need help from somebody much more powerful than myself. I need a stalwart friend who will fight for me and protect me. But who is this stalwart friend? What kind of person is he? I want to exploit a large hapless majority in order to gain great riches for myself. But as an ordinary human being, I am powerless. I may have an exigent personality. I may have extraordinary physical strength and combat skills. But my human senses are very limited. I cannot watch every member of my hapless majority all the time. I cannot strike them down if they disobey me. I could not destroy them if they were to mount an insurrection against me. So how can I control them? I can't. But I know someone who can. He can see everyone all the time, wherever they may be. He can even see into their private thoughts. He can strike them down if they refuse to serve me. He can destroy any insurrection they may mount against me and sentence the perpetrators to an afterlife of eternal torture. He is omnipotent. He is invisible. He cannot be dis­cerned by human senses. They cannot know he is watching them. They live in fear of what he may see. And he is on my side. He will always act in my interest. He will defend me against my enemies. He is my stalwart and faithful friend. But he isn't real. I have created him. I have a personality disorder. I cannot form egalitarian relationships with real peo­ple. I cannot make friends. I feel alone. I need an imaginary friend. It is the only way I can fill the yearning from my lack of real human intimacy. So an imaginary friend gradually takes shape within my mind. He becomes ever more real. Soon, he begins to talk to me. I hear his voice. What does he say? He is my creation. So naturally, he tells me what I want to hear. He tells me what will satisfy my selfish ambitions. He reveals to me laws that others must obey. He gives me the power of life and death. He makes me king over those I conquer. I am culpable for nothing. I am merely the servant carrying out the will of the master I have created.